Standing just a few feet away with a mask on, Reuters photojournalist Kim Kyung-Hoon spots the woman, who is hard to miss in her bright purple and blue-green blouse bearing characters from the movie Frozen. He snaps a picture, capturing the look on her face as she frantically tries to drag her two small children away from the gas as it spreads. The powerful image, which appeared on the websites and front pages of American news organisations, including the Washington Post, has provoked outrage on social media. The picture contradicts the image of violent migrants that US President Donald Trump had conjured up on Twitter and at campaign rallies ahead of the midterm elections. The smoke from the tear-gas canister, the children in diapers, the look of anguish, the wall in the background, that Frozen T-shirt all encapsulated the chaos of that day, and for Kim, the truth about Central American migrants, whom he had been following for nearly two weeks as they made their way across Mexico and towards the US to seek asylum. Kim has been following the migrants since he arrived on November 14 in Mexico City. He captured images of migrant children sitting inside a bus as they waited for some food in Culiacan, Mexico. He followed migrants at a gas station in Navojoa, Mexico, where they bathed and waited in line for food. And in Mexicali, Mexico, migrants piled like sardines on top of trucks as they traveled east to Tijuana. 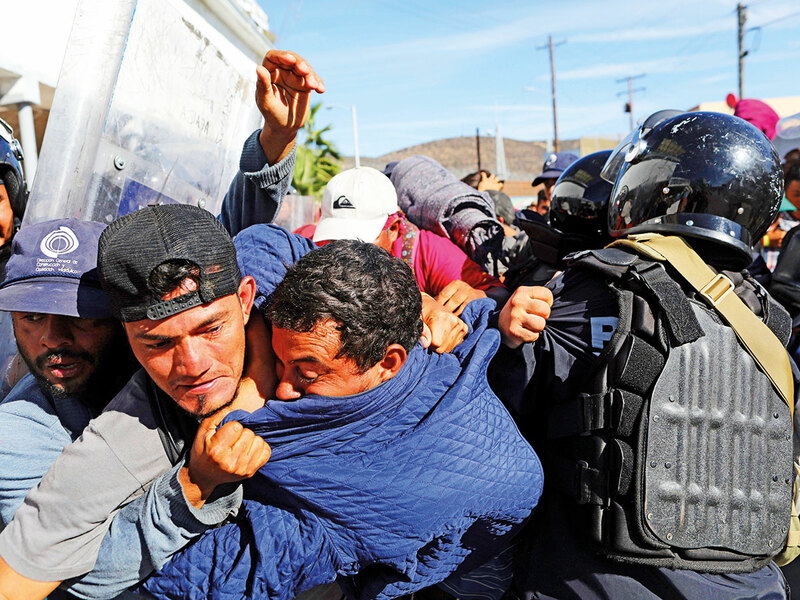 The migrants arrived in Tijuana several days ago and had been camped out at a sports complex not far from the US border. 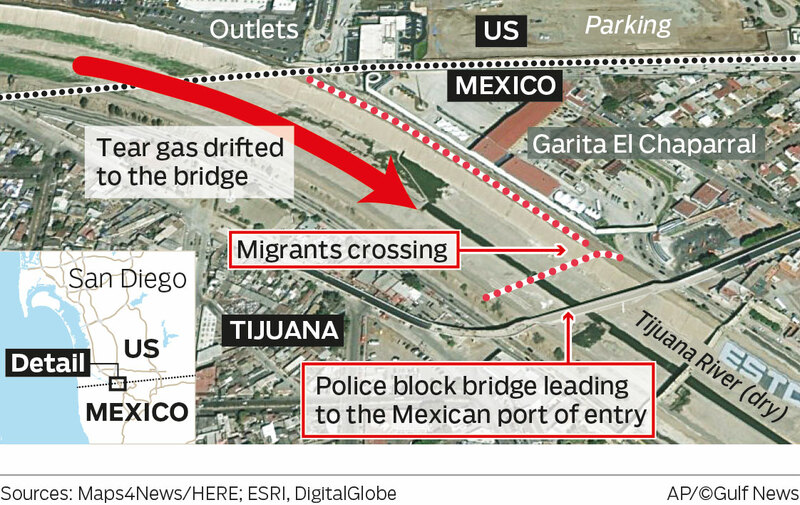 On Sunday morning, some of them began to march towards the San Ysidro border crossing. They carried flags from their country, and banners that said “TRUMP WE HATE YOU NOT” and “MR TRUMP HELP US PLEASE”. Kim followed the group, spotting several children and people carrying strollers. A majority of the group gathered near the border peacefully, while thousands of others did not march and stayed at the sports complex. 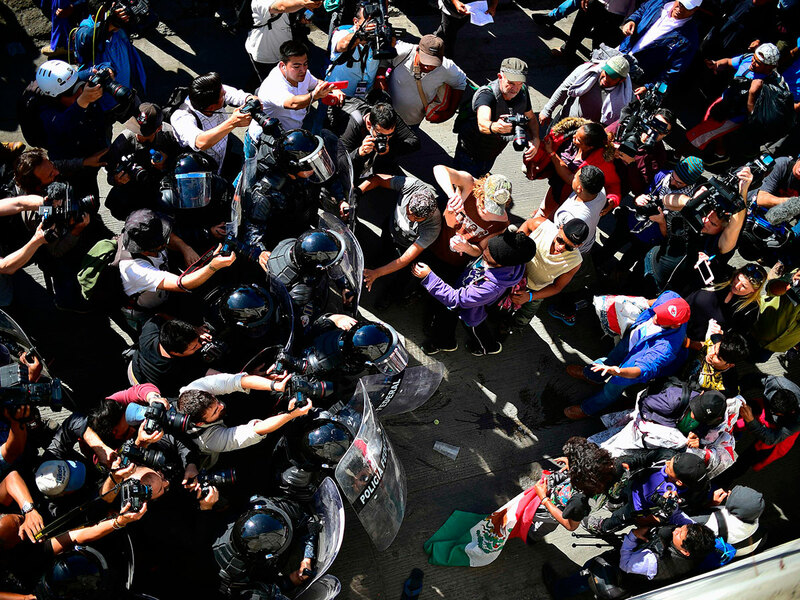 But a scuffle broke out between Mexican police in riot gear and a couple of dozen protesters, with some running across a dry canal and others trying to cross through different entry points. Kim recalled seeing two men trying to dismantle the wire fence. 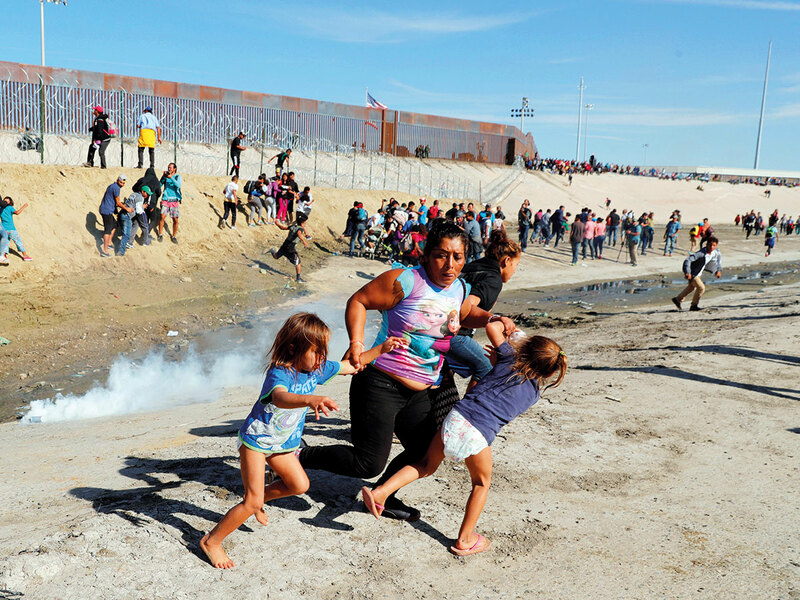 US officials say some threw rocks and bottles at border officers, who then fired tear gas to disperse the crowd. Then Kim saw the woman as she started running from the smoke, holding her five-year-old twin daughters with both hands. Her teenage son was running next to her, Kim said. A Reuters spokeswoman confirmed that the woman had travelled from Honduras to Mexico with all of her five children. Kim followed the family as they rushed back towards Tijuana, crossing a river and climbing up a concrete barrier. When they got to the top, one of the twins began crying, her tiny face full of anguish as she held on to what looks like a small plastic ball. Kim said the girl was pointing towards her bare feet. She had just lost her slippers. Kim, who is Korean, does not speak Spanish and said he was able to ask the woman only where they were from. Later, a colleague was able to find the family, which had returned to the sports complex. Reuters learned that the woman had left Honduras to reunite with her children’s father, who is in the US, Kim said. Trump weighed in on Monday, calling on Mexico to “move the flag-waving Migrants, many of whom are stone cold criminals, back to their countries”, and threatening to close the border permanently. In a statement issued on Monday evening, US Homeland Security Secretary Kirstjen Nielsen advised parents to “refrain from attempts to illegally enter our country — these acts will put your children in danger”. Where migrants seeking asylum in the US will stay while their claims move through US courts remains unclear. Trump had tweeted that migrants will not be allowed into the US until the courts approved their claims. Washington Post reported earlier that Mexico’s incoming government had agreed to let migrants stay in that country while their asylum claims were being processed. However, officials backtracked after the Post story prompted criticism that they were acceding to pressure from Trump. They denied that an agreement had been reached and said talks with the Trump administration are ongoing. Washington Post’s Joshua Partlow, Sarah Kinosian and Nick Miroff contributed to this article.